“The voice behind “He’s a Rebel” and much of the A Christmas Gift for You from Phil Spector album, Darlene Love is one of the iconic voices of the girl group era. The New York Times raved …”Darlene Love’s thunderbolt voice is as embedded in the history of rock and roll as Eric Clapton’s guitar or Bob Dylan’s lyrics.” Through the years, Darlene Love continues to captivate audiences worldwide with her warm, gracious stage presence and superb performances. Through Oct. 14. James Cohan, 533 West 26th Street, Manhattan; 212-714-9500, jamescohan.com. September usually brings a wealth of must-see solo exhibitions, and this year is no different. “A Line Can Go Anywhere,” at James Cohan, however, is a notable group show that shouldn’t be missed. 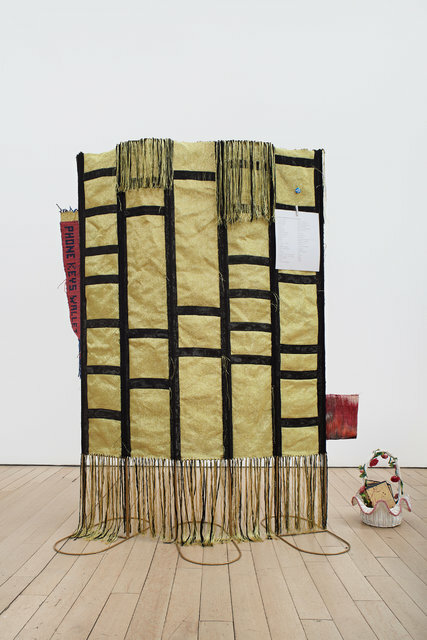 This terrific exhibition, organized by Jenelle Porter, who curated the landmark “Fiber: Sculpture 1960-present” at the Institute of Contemporary Art, Boston, in 2015, includes seven artists from the San Francisco Bay Area working in the fiber tradition. Among the influential figures here are Trude Guermonprez (1910-1975), who trained at the Bauhaus and taught alongside Anni Albers at Black Mountain College, and Ed Rossbach (1914-2002), who came out of the California Funk Art tradition. Ms. Guermonprez is represented by elegant woven works, including two from her 1960s “Space Hanging” series. Mr. Rossbach’s wonky-shaped raffia baskets are joined by his “After Miro” (1970), which looks like an acid-colored spider web. Alexandra Jacopetti Hart and Kay Sekimachi, who studied with Ms. Guermonprez in the 1950s, represent a middle generation. Both work with grids: Ms. Hart’s “Nebulae” (1982) is a lovely jumble of pastel rectangles, and Ms. Sekimachi’s muted-linen squares hark back to the Bauhaus weaving tradition. Terri Friedman, Josh Faught and Ruth Laskey are younger artists making the case for fiber art in the technology-saturated present. Ms. Friedman’s “YES” (2016) looks like a bright wool (electric pink and yellow-green), acrylic and cotton circuit board. Ms. Laskey’s handwoven panels resemble Ellsworth Kelly’s work or Sol LeWitt’s fragmented abstractions, and Mr. Faught’s virtuosic weavings include funny texts that reference new technology and social media — retorts, essentially, to contemporary criticism of fiber art. Through Oct. 14. Paula Cooper Gallery, 534 West 21st Street, Manhattan; 212-255-1105, paulacoopergallery.com. “Brussels has drawn even with Berlin as Europe’s coolest city for contemporary art, but amid its new galleries and cheap studios are grand, gruesome reminders of Belgium’s 19th-century empire. None are more imposing than the Palais de Justice, or central courthouse, a ghastly mash-up of Baroque, classical and Assyrian motifs that sprawls over more than six acres of the capital’s heart. (“It wants to be as terrible as the Law, severe and sumptuously naked,” Verlaine wrote after seeing it.) It’s here that the British-American artist Carey Young shot her icy, thoughtful, technically accomplished new video, which takes a distinctly feminist view of jurisprudence. And one that the New Yorker likes very much. Casey Kaplan Gallery, 121 W27th St.
For other selected Museum and Gallery Special Exhibitions see recent posts in right sidebar dated 10/07 and 10/05. This entry was posted in Uncategorized and tagged 54 Sings Lennon: A Broadway Reunion, ‘La Bohème’, Christine Ebersole: After the Ball, Darlene Love, JOAN SHELLEY, NYC Events, RAZA Y RESISTENCIA, SARAH ELIZABETH CHARLES AND SCOPE. Bookmark the permalink.